What Is False Flax Oil? 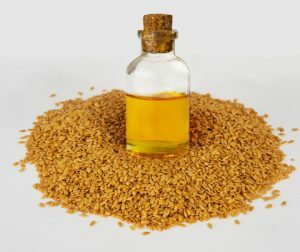 A bit different than the traditional flaxseed oil you've likely heard about and may even take, false flax is also known as camelina sativa or wild flax and has been an oil-bearing entity for thousands of years. One of the reasons that it is so healthy and sustainable as an oil is because it has a very high amount of omega-3 fatty acids, which are tremendously healthy for the body. Within each dosage it contains as much as 45% of the necessary omega-3 fatty acids. This is pretty incredible. This oil can be taken as an everyday supplement as your personal daily dosage of omega-3 fatty acids or it can be used in a whole host of other ways. Here are some suggestions. Because of the vitamin E properties, as well as the fatty acids, this is a great way to moisturize and protect the skin from those pesky free radicals in the environment. This is a very light oil so you don't have to worry about it becoming greasy or too thick when you use it. In fact, this is the perfect oil to use as a light protective, hydrating coating on the skin. If you are someone who suffers from oily skin on a notorious basis, it's important that you don't shy away from properly moisturizing your skin. The presence or overproduction of oil is often because your skin is actually under moisturized and not hydrated. Your scalp can be a very tricky entity that gives way to the health and luster of your hair. Bad hair days are tough on everyone and, unfortunately, no one is exempt. False flax oil can be used on the scalp as a hot oil massage, much like many other variations of oil. But because of the healing properties intrinsically within the oil, it can help to eliminate itchy, dry scalp that often leads to dandruff. Not only will it do wonders for your hair but the antioxidants within the oil do a tremendous job of protecting the hair shaft itself. So if you are suffering from hair that is hard to manage or perpetually dry, try a few drops of this oil as a part of your hair care regimen. The great thing about this oil is that it's naturally food grade and can be consumed. It is known to lower triglyceride levels, which is important in maintaining your healthy amounts of cholesterol and lowering the bad cholesterol in your body. This is tied to cardiovascular health and is a very critical part of your overall health. When your triglyceride levels are lowered, it prevents many health incidences such as heart disease. Because this oil has properties that are naturally anti-inflammatory, it would be a great antidote for the joint pain and tightness that you experience. Not only can it be used topically to reduce the discomfort and pain of arthritis but when it is ingested, the high amounts of omega 3 also help with the inflammation you likely experience. You can purchase false flax oil online from several companies at amazon.com.